Dartmouth depends on the River Dart; its situation on a sheltered natural harbour proving of such great strategic military and commercial value that development was encouraged and sustained from the early middle ages onwards. Less conducive to development were the steeply-sided inland valleys, which left the town inaccessible to wheeled transport until the 19th century. Its maritime attractions, however, outweighed the challenges of its inland topography, resulting in generations of inventive building solutions. These have shaped a contrasting townscape of narrow medieval streets following the contours of the steep valley sides strung with rows of terraced housing and areas of flat, reclaimed land consisting of open spaces and orderly development. Of the early settlement at Townstal the only surviving built fabric is a Norman font with octagonal bowl, enriched by a shallow blind arcade in the parish church of St Clements (Grade I). The church itself dates largely from the early 14th century, restored in the late 19th. Although no buildings survive from the early riverside development of Hardnesse, the houses on Clarence Street sit on the original burgage plots. In neighbouring Clifton to the south of Hardnesse the church of St Saviour (Grade I), consecrated in 1372, is a significant remnant of the medieval settlement. In addition to its medieval fabric the church has a number of unusual features such as the obelisk pinnacles on the church tower and window tracery, described by Pevsner as ‘curious’, which date from the 17th century when the church was under the care of the town corporation. Built evidence of Dartmouth’s strategic military significance in the late 15th and early 16th centuries includes most notably Dartmouth Castle (listed Grade I and scheduled) to the south of the settlement. Constructed in 1494 in response to the threat of French attack, the design incorporates an oblong basement room with seven gun openings of then cutting-edge design. The castle development includes the Church of St Petroc (Grade I) whose tower, along with the 17th-century tower of Gallants Bower gives the defensive complex its distinctive, romantic silhouette. The other surviving military structure from this period is the limestone rubble artillery blockhouse, Bearcove Castle (Grade I and scheduled) built closer to the heart of the settlement c. 1509 to protect the town quay. Wealth generated in the 16th and 17th centuries through trade and fishing led to the remodelling of the waterfront with the construction of The Quay 1584–5 and a florescence of high quality architecture praised by Pevsner as ‘one of the best groups of C17th merchants’ houses in the county’ and by Laithwaite, who described Dartmouth and Totnes as having – ‘much of the best urban domestic building of the sixteenth and the seventeenth centuries, and occasionally earlier’. 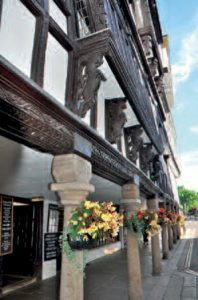 Surviving buildings from this period are generally terraced, three stories high, of timber-frame construction with rubble party walls and gabled facades. The wealth of their owners is reflected in the number of decorative and expensive features such as carved oak corbels supporting jettied upper floors and handsome oriel windows. Notable examples include No. 4 The Quay (Grade II*), The Butterwalk (Grade I), The Shambles (Grade II) and The Cherub (Grade II*). The town continued to flourish during the 18th century – described by Defoe in the 1720s as ‘very large and populous’ with ‘some very flourishing merchants’. Development from this period includes the Mansion House (Grade II*) constructed c. 1730 and with Classical features, and The Old Custom House (Grade II), built three years later with a similarly Classical-influenced design. 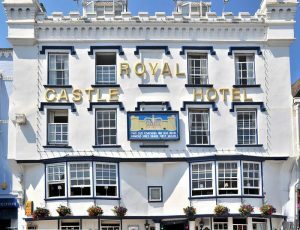 Notable 19th-century development includes the façade of the Castle Hotel of 1835, of exuberant, eclectic design, which conceals two 17th-century merchant houses. Of equal confidence but of a design that references the town’s 17th-century merchant houses is Fairfax Place, a row of shops built in 1880. Since 1863 naval cadets had trained in the town in hulks on the river. However, the need for a permanent land base resulted in the construction of the Royal Naval College between 1902 and 1905 along the hill at Townstal. Designed by Sir Aston Webb (whose previous works included the iconic statue of Queen Victoria in front of Buckingham Palace, and the Victoria and Albert Museum) the College is constructed of brick and stone with Edwardian-Palladian motifs. Despite the imposing bulk of the façade, Pevsner criticises the tower and side cupolas for their lack of impact when viewed from a distance. 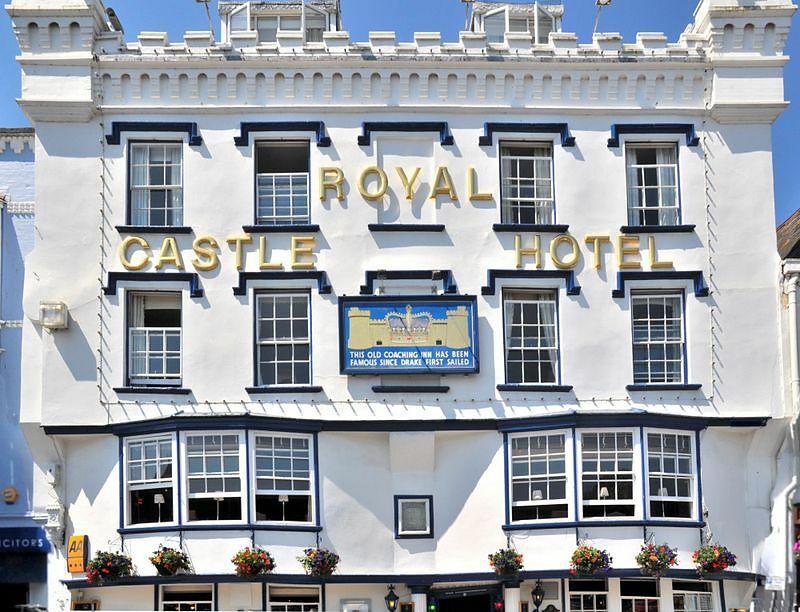 Many of the historic buildings in Dartmouth are constructed from local stone rubble of a grey to brown hue. Exposed stone is generally reserved for the public buildings, whereas domestic facades are often smooth rendered with an incised pattern to imitate ashlar blocks. Brickwork is infrequent and often painted. However there are notable examples of 17th-century buff coloured, small, slim bricks imported from Holland (amongst the earliest usage in the county). Slate is a significant building material in Dartmouth, accounts showing by the 1530’s the regular slating of small houses. In addition to the ubiquitous use of slate as a roofing material, slate hanging is common, including decorative work. A notable number of hand-thrown, pre-20th-century chimney pots survive with distinctive, white slip bands near the crown, almost certainly made at the town pottery.